John Wiley & Sons, 9780470185667, 244pp. Corporate and government scandals continue to deepen our mistrust of leaders. While credibility is the foundation of effective leadership, most leaders struggle, and sometimes fail, to align their words and their actions. Now for the first time, leadership expert Tony Simons has measured the bottom-line value of business leaders who live by their word and actually do what they say they are going to do. 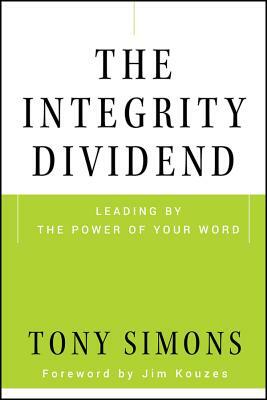 In The Integrity Dividend, Tony Simons shows how leaders? personal integrity drives the profitability and overall success of their organization. This groundbreaking book is based in on solid research and reveals that businesses led by managers of higher integrity enjoy deeper employee commitment, lower turnover, superior customer service, and substantially higher profitability. This improved performance is the integrity dividend. Simons conducted dozens of focus groups, surveyed thousands of employees, collected financial and operational numbers, and interviewed over 100 senior executives and executive coaches. The book lays out the research clearly and provides proven tools for managing common integrity challenges. It offers guidance for building individual credibility and for creating an organizational culture of integrity and accountability. Throughout, Simons uses real-world insight and stories drawn from senior executives, line managers, and coaches. The Integrity Dividend is a fresh view of leadership at a time when it is most needed.